Bookcases are for more than just books these days. Whether you are looking to purchase bookshelves for home or office use, they are an excellent, practical and convenient solution for storage helping to reduce the clutter lying around your space. Book shelving can have many uses around the office. 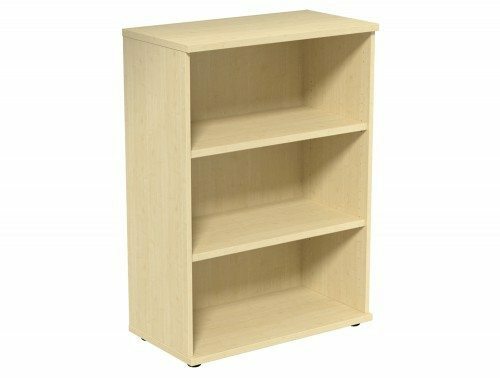 As well as books, you can use solid wood bookcases for storing files, folders, magazines and things you may want to display. The open design offered can be very handy for accessibility purposes. For more personal use at home, bookcases are useful for storing CD’S, DVD’S and displaying picture frames and other household items. All our wooden bookcases are manufactured using the highest quality materials and come from some of the finest suppliers in Europe. 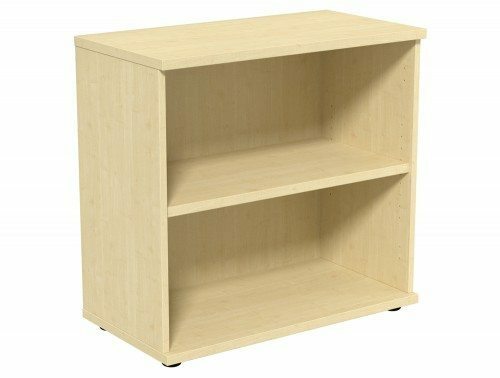 Sourcing our furniture from these suppliers helps us guarantee you the best quality and design book storage unit within your price budget. Radius Office Furniture offers a diverse selection of stylish and durable book shelving designs to fit in perfectly to almost any space. 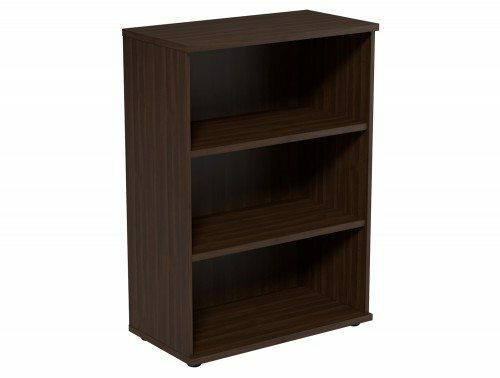 Our wooden bookcase models are available in various heights. You have a choice of desk high or in a 2-level, 3-level, 4-level 5-level and 6-level high to accommodate for the amount of storage space you may need. The wood finishes used are offered in a diverse selection from oak bookshelves, walnut, beech, chestnut and cherry, just to name a few. There are also some white shelving unit, grey and graphite storage colours on offer to suit your office design. A selection of our solid wood bookcases are offered with adjustable shelving options and lockable bookshelves with doors. Some storage units are fitted with glass frosted sliding doors for a sleek and more luxurious look. Furthermore, an array of our levelled bookcases is offered with built in cupboards and are part-open for ease of access. 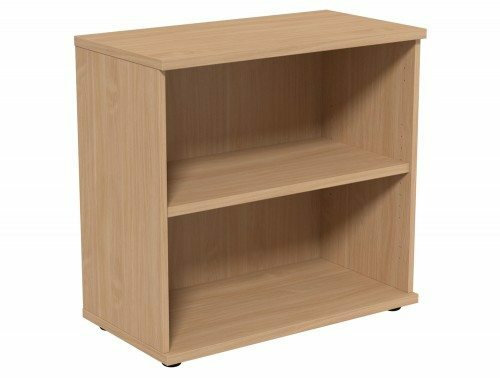 Floor levellers are available with our range of bookcases. These are ideal for workspaces with uneven flooring, enabling you to position your wooden bookshelves wherever you please without worrying about the possibility of the risk of wobbling and losing its balance. The floor levellers are there so help create a perfectly flat positioning for your storage unit. 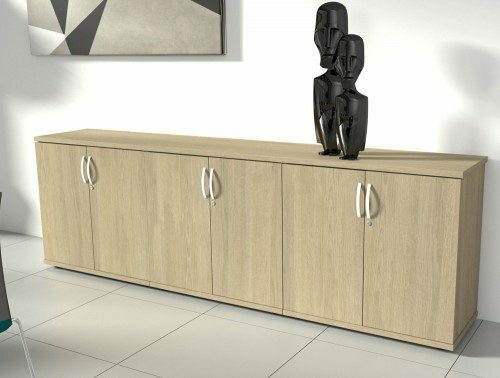 When choosing the right storage unit for your space, it is important to take in to account how you want to use this storage unit. Bookshelves are a convenient way of storing files and other items that you want to access easily. 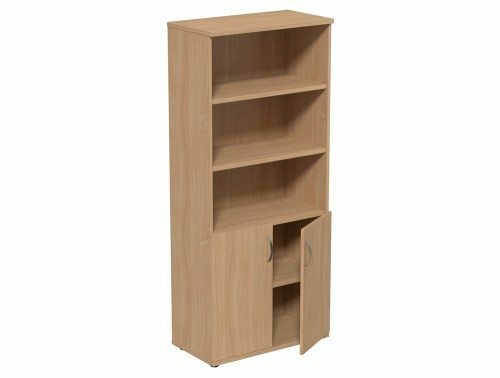 Our online catalogue offers a wide variety of wooden bookcases with doors or without, boasting different styles to suit your needs. We have modular office horizontal bookcases with an open and lockable design for optimum storage. The open and lockable design gives you the best of both worlds, allowing you to put the items you want to access easily on the open storage and lock away all the more valuable and important items in the lockable storage. These are offered with height adjustable options which are the ideal choice if you are planning to store items that are varied in height. 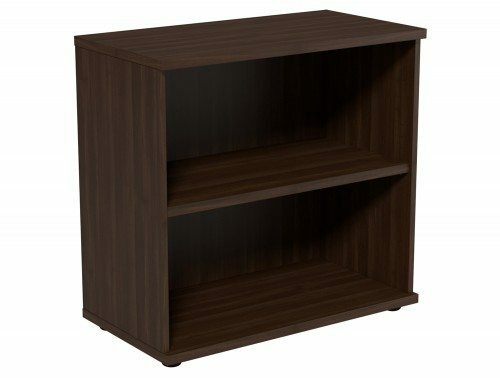 Available in a variety of wood finishes, this type of storage solution is ideal for offices with specific storage needs. 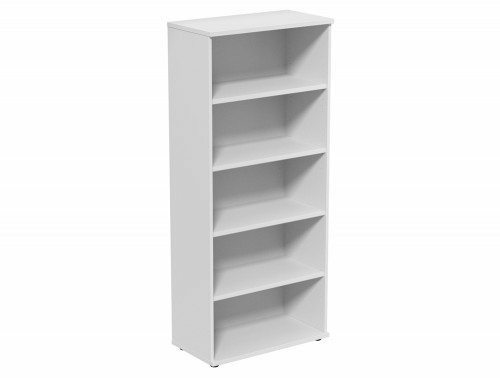 We also offer column storage bookcases which enables you to connect up to five columns of bookshelves storage allowing you to expand your storage if needed. These are a great additional storage solution for small spaces because of its handy and practical design. This would be a great piece of furniture for households who are looking to display some books, frames and other items as the structure does not take up too much space. 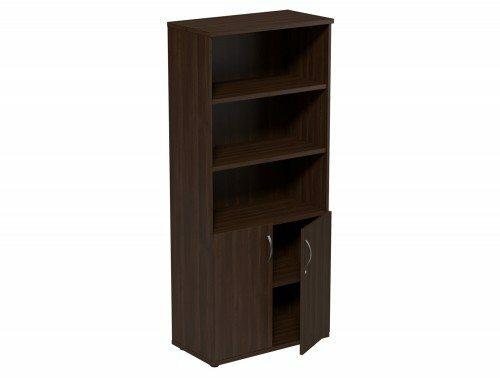 We offer highly affordable storage solutions as well as executive bookshelves designs to accommodate for your price range. 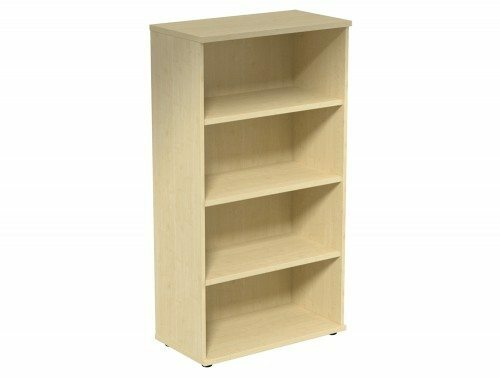 We have an array of used wooden horizontal bookcases if you are looking for an even more affordable price. All our bookshelves, including our heavy-duty designs, are manufactured using the highest quality materials. We have an extensive range of styles and finishes you can choose from to best represent your unique style. 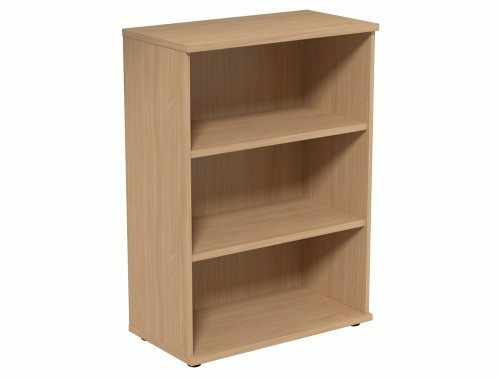 Keep it modern with a crisp, white finish, or go for a more traditional feel with a wooden bookshelf, available in cherry, walnut, oak, chestnut and beech wood finish. Whatever style of shelving you are looking for, you can be sure to find it in our online catalogue. If you’d like to find out more about our range of Bookcases or discuss your requirements, simply request a callback.